Writer Gail Simone positions Wonder Woman as a joint warrior/diplomat perhaps better than any previous writer on the book. Diana has often been dismissed as confusing or contradictory, but here Simone makes the character's philosophies astoundingly clear, perhaps even moreso against a bevy of warrior guest-stars who appear in Wonder Woman: Ends of the Earth. But even as Simone writes a Wonder Woman to be proud of, Ends of the Earth struck me as a little dull; the major subplots move slowly here while the main action seemed like entertaining filler. 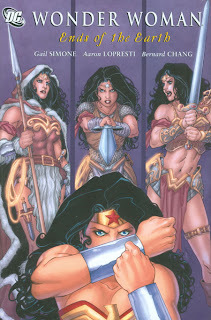 Ends of the Earth pairs Wonder Woman with two standbys from DC Comics's sword-and-sorcery stable, Beowulf, the Stalker, and Claw the Unconquered, continuing Simone's exploration of Wonder Woman the warrior. The story is an example of the exception that proves the rule; the Stalker's Black Horizon drains away Wonder Woman's mercy and compassion, such that we're reminded of Diana's warrior's code by what she's lost, while in large part Beowulfplays the role of Diana's conscience, pulling her back from killing defeated enemies and brokering peace with their reluctant allies. In both the main story and "A Star in the Heavens," Simone appears to be playing with, or perhaps deciding between, the various versions of Wonder Woman over the years. Ends of the Earth has Wonder Woman mostly in warrior's garb instead of her super-hero costume; in "Star in the Heavens," Wonder Woman fights what are essentially prior eras' incarnations of herself. Of her twelve Wonder Woman issues (by the end of this collection), both Ends of the Earth and The Circle are supernatural fantasy-type stories rather than traditional superheroics, and I'm curious to see if Simone continues in this direction with the book. Greg Rucka's run on Wonder Woman approached shades of The West Wing, and while I'm not sure that was the most natural direction for Wonder Woman either, it was certainly fun to read. My wish for Ends of the Earth, however, was that it had more overt relevance as a story. What I liked about The Circle, in addition to being an exciting tale of Wonder Woman challenging both rogue Nazis and errant Amazons who invaded Themiscyria, was that it suggested a change to Wonder Woman's origin; not every story has to be an origin story, of course, but one undoubtedly had the sense that Circle mattered. While there's evidence that threads of Ends of the Earth will be addressed again, Wonder Woman essentially goes, sees, and conquers, and the same for "Star in the Heavens." The next Wonder Woman collection, Rise of the Olympian, begins a major storyline that DC's advertised on par with Superman: New Krypton and Batman: RIP; to that end, Ends of the Earth felt a bit like the filler in between. Of course, I continue to be fascinated by the burgeoning relationship Simone writes between Wonder Woman and Tom "Nemesis" Tresser. While the story of Tom misunderstanding the gorillas in Diana's apartment felt silly (more filler, really), Nemesis's conversations with Donna Troy and Hippolyta leave no doubt that Simone's planning to "go there" -- that is, have Wonder Woman and Nemesis become intimate. Not that there's anything wrong with that -- it's a ridiculous double-standard that Batman can sleep with anyone he meets and Superman can marry Lois Lane, but Wonder Woman must remain celibate -- but I'm amazed that in the world of up-to-the-minute comics journalism, I've not seen one article or editorial addressing what's coming. It ought not be such a big deal, but I bet it will be -- what do you think of the Wonder Woman/Nemesis storyline? Rise of the Olympian, it seems, doesn't come out until November, and I'm disappointed we have to wait that long for the next chapter. I like Simone's Wonder Woman, even if the stories themselves haven't yet crystalized for me, and I'm hoping Olympian is the book where it all comes together. Up next ... Batman and the Outsiders: The Snare. Don't miss it! I like Simone's Wonder Woman, even if the stories themselves haven't yet crystalized for me, and I'm hoping Olympian is the book where it all comes together.I felt the same way as I read through the run as it came out in individual issues, but Rise of the Olympian? Phenomenal. I had to switch to trades on almost everything when my comic shop closed at the beginning of April (one of the reasons I now follow this blog, as it mirrors my own experiences), but every issue of the story up to that point was one of my favorite comics of the month, and they just kept getting better and better. I can't wait for the collected edition. According to the discussions at the recent Bristol comics convention, DC is looking to Simone to write the One Definitive Wonder Woman Story, so it's very interesting to follow her initial work on the character. "Rise of the Olympian, it seems, doesn't come out until November, and I'm disappointed we have to wait that long for the next chapter." To be fair, the next chapter is eight issues long so till November isn't that long a wait. So, so glad to hear all the positive reviews o Rise of the Olympian. Definitely looking forward to it.